Recognition plaques are beautiful and meaningful decorations that show off an individual or team's contributions. Custom award plaques can be used in businesses, schools, and any other type of organization where valuable work deserves to be recognized. Plaque awards from Successories come in a wide variety of sizes and styles, ranging from image plaques to traditional award plaque engraving, to perpetual award plaques that feature motivational quotes. Recipients and organizations will love to display these beautiful forms of recognition, which serve to inspire others as they celebrate hard work and commitment. View more than 100 styles of award plaques below. This is a great award plaque to provide employees as small motivational gifts. We loved the various sayings and the fact that we could put our company logo in the plaque as well.The only thing is that the saying is very difficult to read. The letters are very, very small. Got two of these to give out to people outside our company at our company quarterly meeting. They were pleasantly surprised! The wording says it all! Great price too. Exactly as described, fast shipping! Plaque awards are physical tokens of appreciation whose meaning can extend far beyond their beauty. By taking the time to engrave someone's name and contribution on an award, or by picking out an inspirational message that holds special meaning related to the recipient, you can make a meaningful impact on whomever receives your thoughtful gesture. With an endless amount of customization options from Successories, it's easy to create an award plaque engraving that perfectly suits your organization and its needs. Our unique custom photo plaques are incredibly special, allowing a person or moment in time to forever be commemorated. Award plaques are fitting for just about any type of organization, ranging from large corporations to community buildings and schools. Here are some ideas for how to use recognition plaques. In business: An annual awards ceremony is the perfect time to hand out award plaques to employees who have achieved milestones with your business. Using award plaque engraving for individual awards, you can recognize individual employees based on the amount of time they've worked for your company, for a specific significant achievement they've made, or as a way to commemorate their retirement. 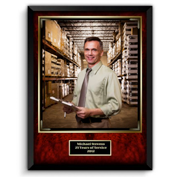 Perpetual plaques can be displayed throughout an office and include winners for awards like employee of the month or top sales associate of the year. These can be updated regularly, so that past and present winners can be recognized as a group. In competition: Any competitive event can be completed with an awards plaque ceremony recognizing winners and participants. These can range from team sports competitions or golf tournaments, to annual awards given out by an organization, such as a newspaper doling out local awards based on reader votes. Film festivals, design competitions, and other community events are all times when award plaques might be appropriate to hand out. In school: Trophy cases and school offices are great places to display recognition for the hard work teachers, school administrators, and even parents do to positively impact a school. They're also great to use as legacy items to recognize outstanding students, athletes, and school donors who enhance a school's history. Award plaques for school contributions are also great for recipients to take home, so they can be reminded that the effort they put in is valued and serves a larger entity. 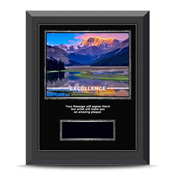 Award plaques can be tailored to fit a theme or desired message, through the customization of photos and inspirational quotes displayed on the award. Having a tangible way to see that work is valued helps to make recipients motivated to continue to pursue their goals and to be essential components of an organization's success. 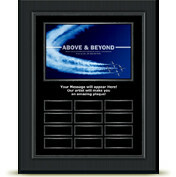 Successories has an extensive selection of beautiful recognition plaques to celebrate any occasion. These plaques are made with high-quality materials so that they are long-lasting and can be proudly displayed prominently in an office, hallway, trophy case, or home. Our custom award plaque engraving allows you to create plaque awards that are truly one-of-a-kind. Recipients will feel special being recognized on high-quality award items like these. When you shop at Successories, you can count on our team to ensure your complete satisfaction with every order. Contact us at 800-535-2773 if you have any questions or need help customizing a meaningful order for your organization. 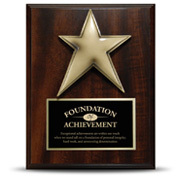 Our experts are here to assist as you shop for award plaques. 8x10 Custom Photo Plaque is a personal & professional award. Recognize many achievements and individuals with a perpetual program. Beautiful wood plaques adorn with custom engraved brass plates make for a truly impressive award. Our classic motivational images & quotes as 7x9 individual award plaques! 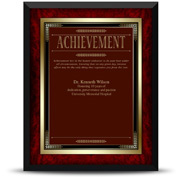 Our best selling laminated award plaques feature your choice of title: Excellence, Achievement or Service.